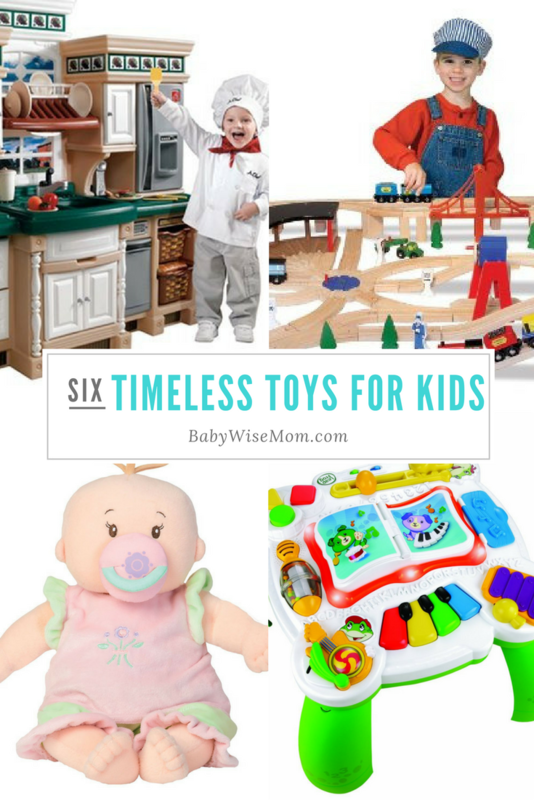 Bethany of http://thegracefulmom.com/ asked me to share my top five favorite toys of all time…which is super, super hard for me to choose just five. Never-the-less, I made this list in about 10 seconds. These are toys I have seen used by my children at various ages, so I call them timeless. We first got this table when my oldest child was 7 months old. This is the number one most played with toy we have ever owned–except the kitchen. See that below. Every child has LOVED this toy, and the children love it for a long, long time. If a parent were able to only buy five toys in the first five years of the child’s life, this should be on their list. We got this toy a little over a year ago at the recommendation of my blog readers. So many of them said their child and children loved it, and that they loved it for years, so I thought I had better try this out. My readers were right (of course)! This is one of those toys that produces giggles like crazy, and it is a fun toy that an older sibling can play with a younger sibling. All three of my kids sit around this toy and laugh and laugh. This is another one of those “so worth it” toys. This was another reader recommendation. Readers suggested I get this for my youngest for her first birthday. I then did a bunch of research and saw how well this rated on Amazon. So we got it. I must say, this is the perfect doll for the young ones! It is soft and it is safe. I love Baby Stella so much that it is my automatic gift to any one year old girl. There are also lots of fun accessories. This is going to be a sneaky way for me to get more than five toys in this post. Anything made by Melissa and Doug is fabulous. We own a whole lot of Melissa and Doug toys, from puzzles, to wooden paper dolls, to train stuff, to kitchen food. You can not go wrong with Melissa and Doug. When Brayden (my oldest) was 2.5, we got him a Thomas the Train figure 8 wooden railway set . It is nice, of course. When he was 3.5, we wanted to expand the set for Christmas. We went to our locally owned toystore. There, a worker told us we should consider Melissa and Doug. He said the quality was excellent and the price was even better. To compare, the Thomas Figure 8 set was $40, while this entire set, trains and all, you see in the picture here is $90. Pretty much a no-brainer. Over the years, we have purchased Thomas destinations and Thomas trains, but have this basic kit that gives you all the track you could ever want. (do you like how I worked in Thomas stuff too? I am tricky). I must add, this is something all three of my children love to play with together. Very popular. A toy kitchen would definitely be on my list of must-have toys (obviously…here it is). We purchased our toy kitchen when our oldest was 18 months old. He loved it from the first moment, and it gets played with constantly. This is our number one most played with toy. The children all play with it together, and it grows with them and their imagination. You also can easily add to it over the years as they mature. A shopping cart, food, dishes, other accessories…it just never gets old. At least not yet. My children 2-6 play with this daily. There are a lot of kitchen options out there. Everyone will have their own preferences depending on desire for wooden, plastic, size, cost, look, etc. Don’t feel like you need to spend a fortune to get your kitchen. My parents still have my old kitchen that is comparable to a $30-50 kitchen today and my kids love it. Kids just love kitchens. I just couldn’t leave this oneTime out. Last but not least. When I was a child, I loved Little People. When my husband was a child, he loved Little People. All three of my children have loved Little People. Just today, my three children made a Little People City and were playing together. There are all sorts of toys available based on interest. I chose to highlight this barn because it has been popular with both genders. My girls have also had a special love for the pet shop and the house, while my son has loved the airport and garage. Hi! I have a 7 month old girl who I've had on a schedule since birth and she became a wonderful napper/sleeper. To the point of putting her down fully awake and she put herself to sleep without crying and slept until her next feeding. It was wonderful!! Now, starting a few weeks ago, she cries and cries for her naps. Her morning nap is usually perfectly fine, and I am very careful with watching for wake time. She doesn't make it past an hour or so before she's yawning/rubbing eyes, and I put her down before she starts whining or crying, so I think I have that part figured out (I think). She is eating solids well and sleeping beautifully at night, but sometimes she cries for her whole nap and we end up skipping it. When I pick her up, she's happy as a lark and not fussy at all until she needs to sleep again. The only thing I can think of is that she's constipated and has been for a while. We are working so hard to deal with this – cutting out ANY food that is constipating or hard to digest. She is strictly breastfed. Is she crying before naps because her tummy hurts? But she doesn't cry any other time of the day. I'm confused! (I thought after you had your first baby you'd be able to figure the rest out! haha! I guess not…)Thanks for all your help!! I agree with everything except for that crazy busy ball popper! Jeez that thing is annoying! ha ha. OK to me, I guess. My daughter likes it ok but doesn't LOVE it and I find it too loud and crazy sounding. And make sure you use it where the balls can't get stuck under the furniture! Ugh. LOL. Wenona, I was going to suggest it would be some sort of pain or a need for a longer waketime or more activity during waketime. Good luck with it!